Overall Dimensions: L = 1250,W = 500,H = 950 mm. The use of microprocessor based controller ensures higher performance reliability of the drier. The controller indicates the pressure dew point for online monitoring. Setting options for controlling the cycle controller and automatic drain valves are provided. 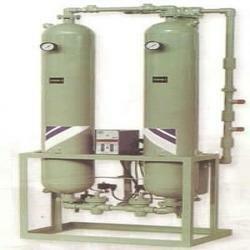 We are offering Trident Air Dryer. This system is designed for pre-heating the rail ends for welding by the alumino-thermic process. The joint is preheated for a moderately low period thereby achieving better metallurgical characteristics by minimizing the width of the heat affected zone. The integrated design, the direct coupling, the low speed of rotation and the limited number of moving parts, making the rotary vane compressor Mattei safe and reliable over time. We supply Refrigerated Air Dryer which is used to remove moisture and unwanted particles to the micron level from the atmosphere. Our range is economical and consumes less power. 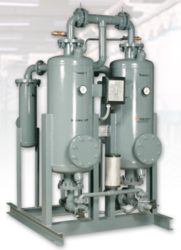 Clubbed with the support and direction of an efficient staff of professionals, we are engaged in offering with a really well-tested and efficient series of Compressed Air Dryer. Air Dryer. Authorised dealer for Anest Iwata, Make - Trident Air Dryers complete range.